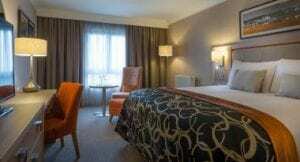 Conveniently located in Central Park, Sandyford, South County Dublin’s premier business district, Clayton Hotel Leopardstown is just a short LUAS ride away from Dundrum and accessible to Dublin’s City Centre. The Dublin Aircoach is accessible from Dublin Airport Terminal 2 which will take approximately 1 hour and 15 minutes to arrive at Clayton Hotel Leopardstown. (Approximately 34km) The Aircoach also departs from the hotel’s front door every 15 minutes between 04.30am to midnight and every half hour from midnight to 04.30. Tickets can be purchased online or from the driver. From Dublin airport drive towards the M1/Dublin road, Take the first exit southbound, remain on the M50 until you reach junction 14 (approximately 30 mins). The hotel is located on the right side of the road. Head northeast on St. Stephen’s Green/R138 toward Hume St, Slight right onto Merrion Row/R138, Slight right onto Pembroke Street Lower/R138, Turn left onto Leeson Street Lower/R138, Continue onto Stillorgan Rd/N11/N31 for 1.8km, Turn right onto Brewery Rd/N31, At the roundabout, take the 3rd exit onto Leopardstown Rd/N31/R113. The hotel is located on the left side of the road. On-site parking is available. The LUAS Green Line tram is a 1-minute walk from the hotel with its own ‘Central Park’ stop. It begins at Cherrywood and will leave you into the city centre at St. Stephen’s Green within 20 minutes. Parking for hotel guests is available. The car park is located underneath the hotel where there is a special €10 overnight rate available for all guests, this can be paid directly at reception. The car park is located underneath the hotel and is accessible by elevator to all floors. For non-residents, the car park is charged at €2.80 per hour or €16 per day. Here at the hotel, we have two Tesla charge points and an ecars charge point available in our underground car park.